Inspiration to be creative comes in so many different ways. It is particularly powerful and motivating to find it through conversations with confident, ambitious and inventive individuals making their own unique mark on this world. I had the pleasure of talking to Titi Ademola ,a designer who illustrates that fashion is an art form just as colourful, vibrant and expressive as any other. I was inquisitive to know her views on the fashion industry and her objectives for the future. How did you arrive at running your company and has fashion always been your calling? I’ve always wanted to do fashion for as long as I can remember; it has definitely been a calling. I wasn’t quite sure if I would be taken seriously by my family to study a Bachelors degree in Fashion Design, but I thank God they were all very supportive. After my univesity studies and work experience for two years predominately in Atlanta, Georgia, I decided to move to Ghana and start my own business. Through the grace and favor of God, the commendable loyalty of clients and friends and hardwork and determination, KIKI Clothing has become a household name in Ghana. Where do you see KIKI Clothing in five ten years time? I visualize KIKI Clothing taking advantage of selling our products to a credible and diverse market within Africa. Additionally, I would love to see KIKI Clothing have a successful presence in other parts of the world, including America, Asia and Europe. We hope to achieve this through an online store that will be launching in the coming months as well as by exporting and establishing retail outlets too. I commend you for your support for worthwhile causes, most notably raising much needed funds for the earthquake victims of Haiti. Could you talk about this further? Well, KIKI Clothing is a big believer in giving back and we feel privileged to be assoicated with events and shows that raise awareness, funds and support to charities. We mainly support young children related charities within Ghana. I’ve always seen fashion designers as artists in their own right. As a designer, do you see fashion fundamentally as art? Yes it is art. It really is. The colours, shapes, designs and textures of fabrics used in addition to sihouettes made, are all really works of art. Sometimes this appears more evident in Afro centric designs. You have exhibited at international fashion shows and as a consequence your Afro centric and cultural style has been successfully represented. How wide is the demand outside West Africa for your style of clothing? That’s the beauty of this age of technology. Through the internet, blogs and social networking sites, entrepenuers can reach out to potential clients more and have an easier time marketing brands to a wide range of people from all over the world. Through our website we receive mail from people all over, who are attracted to our designs and interested in buying and promoting our products. 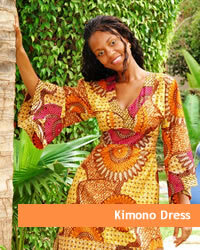 The demand for KIKI Clothing items, outside West Africa, is growing. And we would like to meet the demand and act while the interest is still there. We are hopeful the introduction of our online store will be a step in the right direction. Your clothing range is colourful and vibrant but appears limited to women and children. Is male clothing a completely different market and if so why? KIKI Clothing started out as KIKI for Kids. I wanted to tap into a market I felt exsisted in Ghana but was not being addressed. 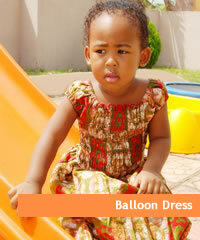 I thought designing Afrocentric children’s clothes would be a good way to start my business. Shortly after, the mothers buying clothes for their children, kept asking for clothes for themselves. It wasn’t long before KIKI for Kids was changed to KIKI Clothing. As a small scale business, I didn’t want to spread myself to thin, where I comprised quality for quantity. I hope to eventually design a unique menswear range. But for now we cater to men through our footwear collection and T-shirts. The leading British photographer Nick Knight was quoted as saying the fashion industry and advertising industries are steeped in racism. Do you think that’s true? Well, I completed a First Fashion Award and an HND course at the London College of Fashion. I then started my BA degree there and after a term transferred to the American Intercontinental University in Atlanta, Georgia. My experiences in both countries were similar. Whether it was interning in New York City or working part time as a sales assistant for a fashion label, I felt there wasn’t much room for black models, black photographers, black designers or black magazine editors. It’s a very exclusive industry in both London and New York. That’s not to say one should give up on their dream or settle for less. I think it should motivate myself and others to strive to be the first or to be amongst the few. I don’t believe the industry has changed much in the past twenty thirty years regarding the issue of racism. I recall the controversy over Vogue Italia’s decision to ‘counterattack’ racism by publishing a ‘black model only’ addition. What’s your experience of the fashion world in the Africa; is it just a controversial? No it is not as controversial in Africa. On a completely separate note, I know you’re a Chelsea football supporter. Can I ask why???? Oh well, despite not being a Spurs fan like myself, I wish you well with your endeavours! For further information please visit. Bob Marley’s Death: Could this have been prevented?